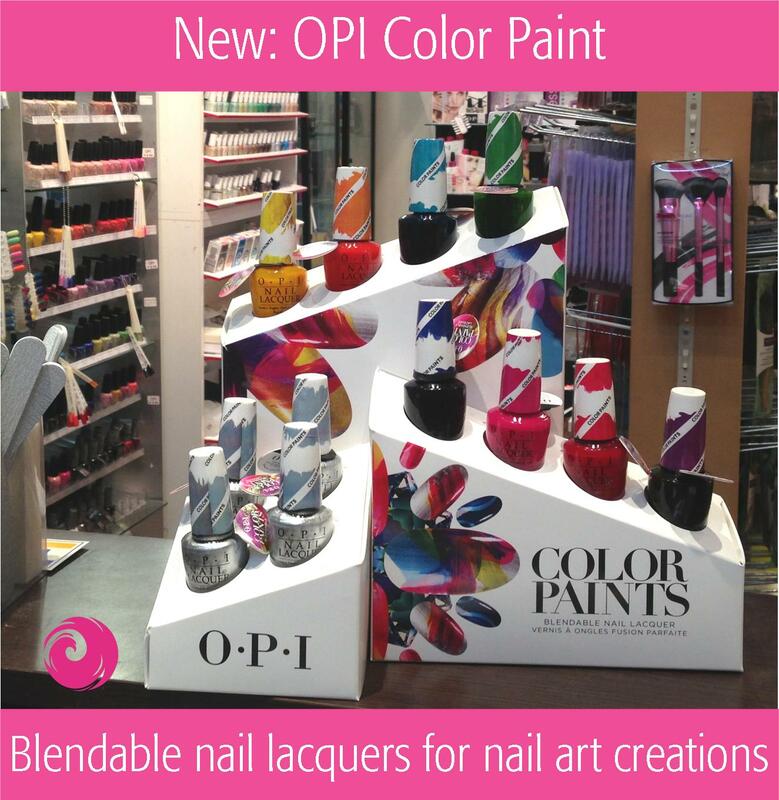 New: ColorPaints by OPI Blendable Nail Lacquer – Make a play date with colour! IDEA: Translucent colors to layer and blend for endless nail art looks. OPI Silver Canvas – A clean-slate silver to illuminate your masterpiece. OPI Primarily Yellow – Paint some sunshine with this glowing yellow. OPI Chromatic Orange – This freshly squeezed orange is awash with color. OPI Pen & Pink – I’m irresistibly drawn to this rosy pink. OPI Magenta Muse – This sultry red-violet is truly inspiring. OPI Purple Perspective – The depth of this purple is mesmerizing. OPI Indigo Motif – I have designs on this deep, midnight blue. OPI Turquoise Aesthetic – Beauty is in the eye of this deep aqua. OPI Landscape Artist – The lush, verdant green of wide-open vistas. 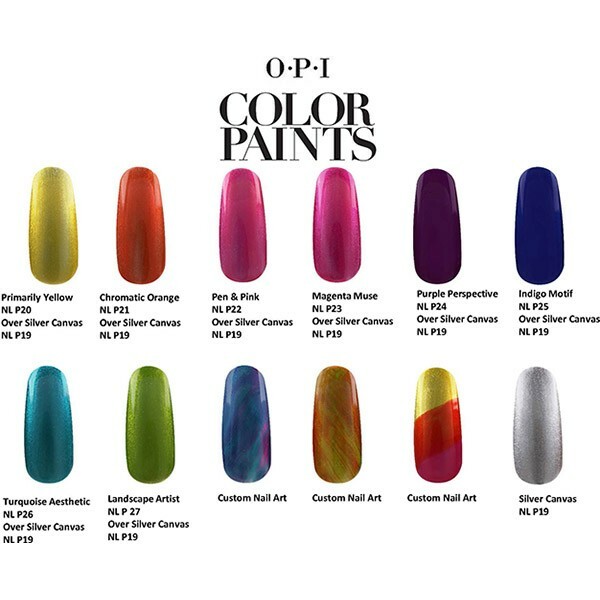 Each of the 9 bottles available within the OPI Color Paints summer 2015 nail polish collection retails for $9.99. When buying your favorite color make sure to get that silver base coat as well, as the secret of creating interesting designs lies in using exactly this shade in combination with one or more colors you like in the collection. In addition, there’s an OPI Color Paint mini set of the lacquers available for purchase, which might seem more practical for some of you. ABOUT OPI As the number one salon brand worldwide, OPI is committed to providing high-quality products and services to both salons and their customers, along with a focus on industry safety and innovation. Known for its exceptional formulas, fashionable colors, and iconic names, OPI’s heavily pigmented lacquers are super rich, long-lasting and chip-resistant – offering an affordable luxury to consumers. OPI Nail Lacquer is available in more than 200 shades. Each lacquer features OPI’s exclusive ProWide™ Brush for the ultimate application. Currently, OPI is available in over 100 countries and retails a full line of professional items including OPI GelColor, which is available in more than 150 shades that match the iconic OPI colors that are known and loved, nail treatments, finishing products, lotions, manicure/pedicure products, files, tools, gels and acrylics. $9.99 each and free worldwide shipping on orders over $40. This entry was posted in Collection previews, Colors, Gift Ideas, Nail Art, New Arrivals, News, opi, Press Release, Product in Focus, Swatches and tagged nail art, New Arrivals, new collection, new opi collection, opi color paints, opi nail art by phoenixbeautylounge. Bookmark the permalink.